Elizabeth and I read this book again today. 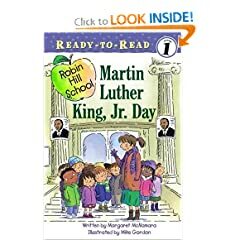 It's a sweet little story where a class of kids is learning about Dr. King and then their teacher has them draw pictures of what their dreams are. You see the purple person? He's sad; he only has one balloon. The red person has two balloons; he is happy. In Elizabeth's world, the definition of sadness is having only one balloon, and happiness, having two. There are very specific details Elizabeth always puts on people that she draws. It began with always adding bellybuttons to tummies. Then she started including thick, rectangular necks. Now, it's nostrils. Those are some noses, eh? If you have kids, do they have curious little details they always include on people or other creatures they draw? I conclude with today's advice: If you're feeling sad, go get two balloons. You'll likely be feeling better in no time! The additional commentary on happiness from the magnet made me chuckle. i just realized that made me sound especially sad, and i'm not, i just like the idea that two balloons would bring particular happiness! and i love how 5-yr-olds think!